Hello and welcome to episode number three of a series of videos and posts with other members of our Crystal Pig Hunt Club (CPHC), from the 2017/18 Georgia deer hunting season. The season is over but work on our property never stops. 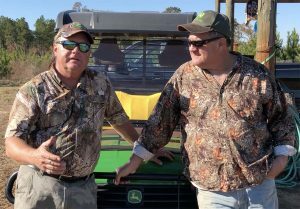 On our last day during the season, Paul and I talked about the John Deere Gator XUV825i we test drove. The Gator is just a solid machine and we put it through its paces in different weather and ground conditions. Time to debut episode 3 of Chuck Zimmerman's review of the John Deere 825i Crossover Utility Vehicle. Hello and welcome to episode number two of a series of videos and posts I’m doing, along with other members of our Crystal Pig Hunt Club (CPHC), throughout the Georgia deer hunting season. We’re well into this year’s season and have been out on the property several times. I’m making plans for at least one more trip this year, keeping my finger crossed. 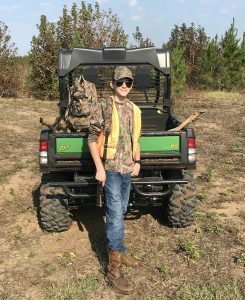 Here’s Paul’s son, Joe, who once again got his deer on his first trip out. He got to ride in the John Deere Gator XUV825i we’ve been test driving and likes it. In the video below you can hear him talk to Paul about hunting with a Gator while they are heading out to their stands on a sunny afternoon. Chuck Zimmerman’s nephew Joe went deer hunting with his Dad Paul. They seem to like having a John Deere Gator to get out into the woods with. He think this young man is going to be an awesome deerslayer! Howdy from The Pig. The CPHC team just continues to have good success early in the season. We’ve got a nice long season to go though since the Georgia season for firearms which started October 21 runs through January 14. 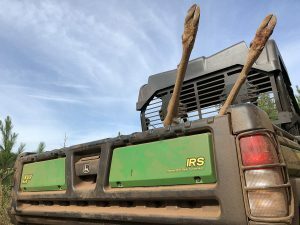 In this post I’m going to start letting you know how we are using a John Deere Gator XUV825i to test drive and evaluate its value to some serious deer hunting. John Deere has provided us with the use of this vehicle for most of the season and I have now had the opportunity to get some hours in and out of the woods and on the trails. As you can see in the photo I have already harvested some deer and brought them out of the woods and back to our camp. My harvest so far consists of a 6pt buck, 2 does and a wild hog. They have all been bagged right near our trails fortunately for me. Speaking of trails, most of ours are freshly plowed by the U.S. Forest Service. They do a great job btw. But we’ve got some serious and deep sugar sand to run through and there are rough spots. You’ll be able to see that in the video below. John Deere has some accessories I already know I’d like to add! So, I’ll have more to say in upcoming episodes. I’m very satisfied with this unit and am not coming up with anything to complain about.